With the chill of winter still upon us, it's hard to believe baseball spring training starts later this month in Florida and Arizona. For fans of the game, spring training signals the start of a new season; but baseball is always in season in Cooperstown, home of the National Baseball Hall of Fame and Museum. With exhibits and special programming throughout the year, baseball lovers can get a first-hand look at some of the most famous artifacts of the sport, and celebrate their favorite team. For the ultimate baseball fan, this package is the best way to get an exclusive look at your favorite team. Fans will enjoy an after-hours tour of the museum, a private reception at the Hall, plus a behind-the-scenes look at artifacts not currently on display in the museum. While in town, visitors will enjoy the luxurious accommodations at The Otesaga, a short walk to the Hall of Fame. Power up with our delicious breakfast before heading off for a full day of everything baseball. Memorial Day weekend in Cooperstown brings a host of recently retired fan favorite players and Hall of Famers to Doubleday Field. The Hall of Fame Classic is is the perfect opportunity to watch a ballgame in this historic stadium, with Hall of Famers like Ozzie Smith and Rollie Fingers managing a roster with players such as Shane Victorino and AJ Pierzynski. Other activities offered include the Cooperstown Classic Clinic, a free event that gives children ages 7-12 the opportunity to learn skills from former players and Night at the Museum, a ticketed event that brings fans, Hall of Famers and former players together for an evening in the museum. Of course, the premiere event on the calendar for the Hall of Fame is Induction Weekend, where the legends of the game welcome the newest members to their hallowed ranks. The induction ceremony is the culmination of a weekend full of events, including the Legends Parade, where pick-up trucks ferry Hall of Famers down Main Street, which is lined with fans seeking a glimpse of their favorite players. The 2019 class of players includes fan-favorites Lee Smith, Harold Baines, Mariano Rivera, Edgar Martinez, Mike Mussina, and the late Roy Halladay. 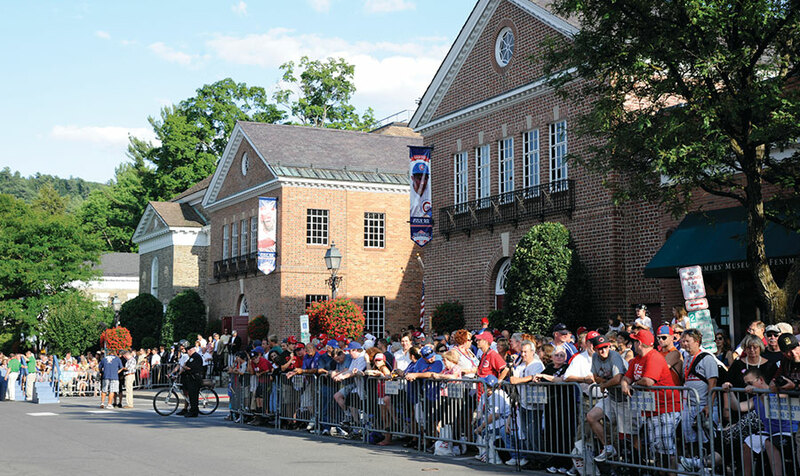 Of course, with programming and exhibits throughout the year, there's never a bad time for baseball fans to make the pilgrimage to Cooperstown. The Double Play Package at The Otesaga includes tickets to the Hall of Fame, as well as a souvenir bat to commemorate your special trip. For baseball lovers, there's no better destination than Cooperstown. Contact The Otesaga today to enjoy the ultimate baseball getaway.